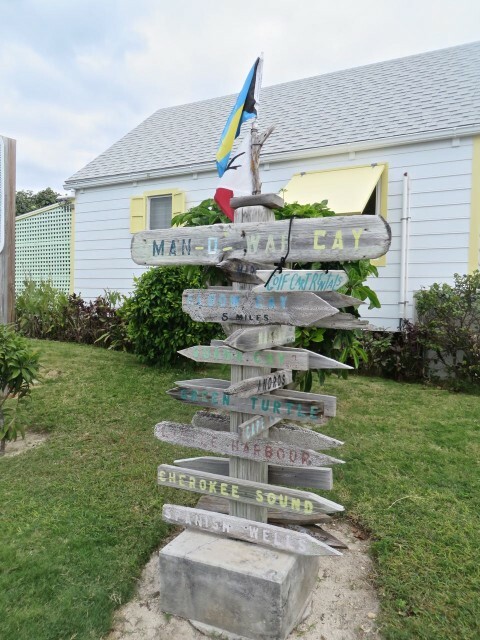 The weekend brought another chance to get out and about in the Abacos, to wander aimlessly, as Will says on the Cruisers Net. Where to go? 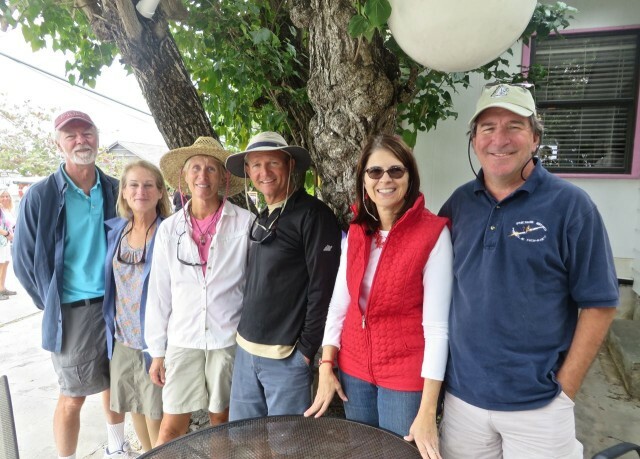 Let’s head over to Great Guana Cay. 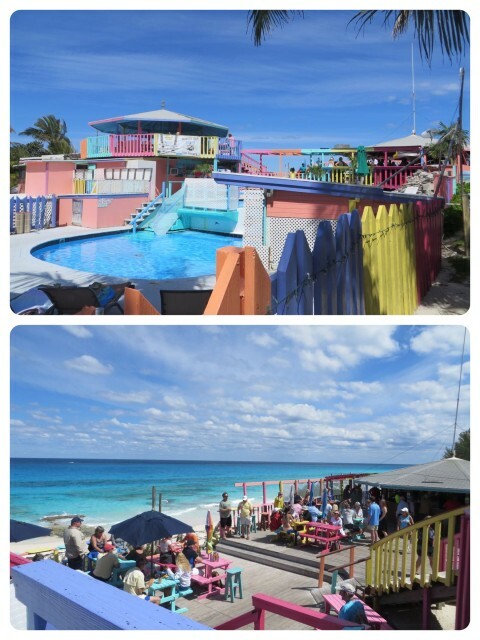 We had stopped there twice (Great Guana Cay and A Visit with Friends from Home) on our last trip, but this time we would be there on a Sunday. 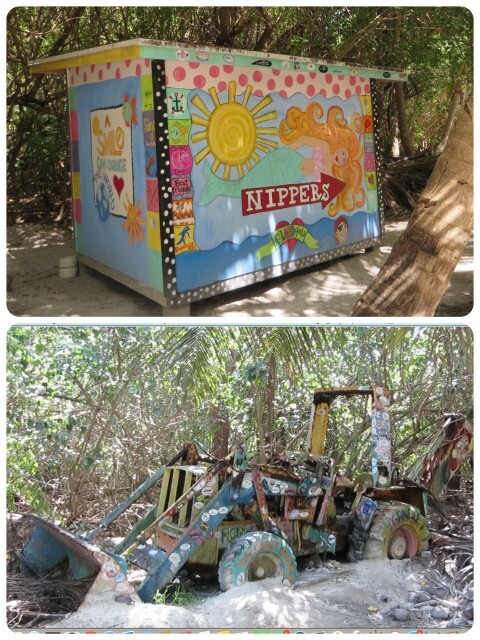 Sunday = Nippers Beach Bar & Grill’s infamous Pig Roast. Time to do the tourist thing and check out this famous rowdy Sunday event. 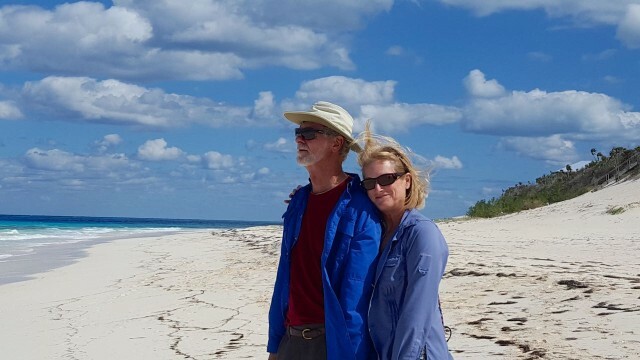 The day was cool as we motored over to Great Guana Cay, but the sun was shining and gave us some warmth. 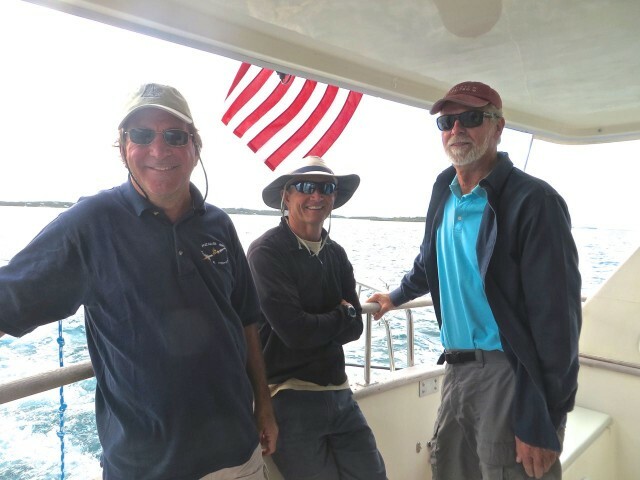 We anchored just north of the inner harbor at Guana. The water was simply beautiful. I say it over and over, but sometimes I just can’t believe it is really this beautiful until I look down again and see right through it. 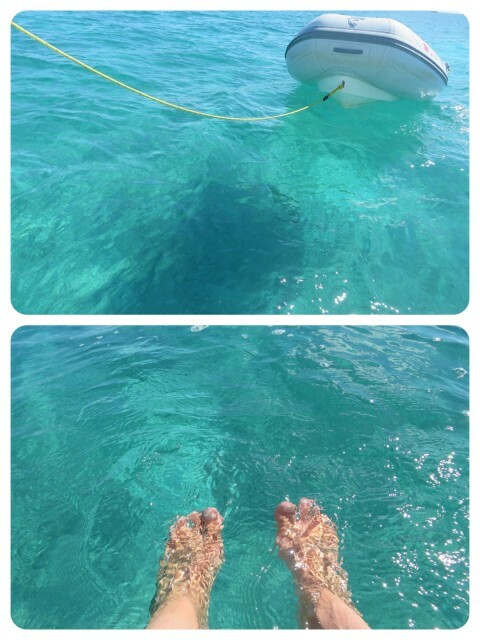 That’s what we like most about getting out and about – the gorgeous clear green-blue water. The shadow of the dinghy on the bottom. My toes splashing in the cool water. The sun felt warm so I spent time on the transom peeling off the flaking skin from some conch shells. A 20-minute dip in the water also felt good, although the water was only 72 degrees (was 80 in December) and the air was barely 70. After a quiet afternoon, Magnolia joined us, arriving from Man O’ War where they had spent the afternoon. 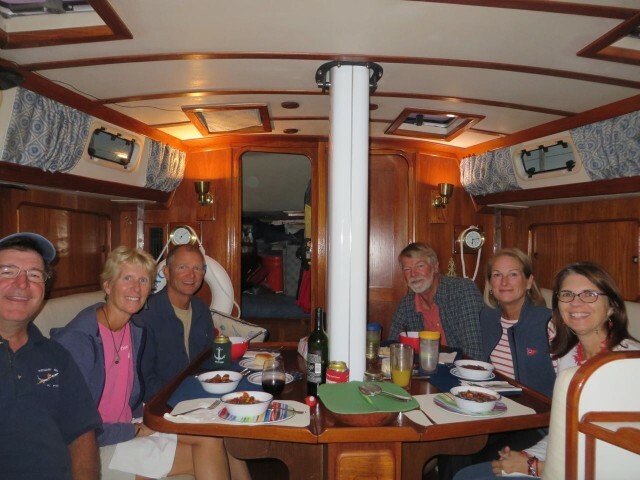 We ate dinner onboard Kindred Spirit, enjoying good company once again. By evening the anchorage was no longer so quiet. 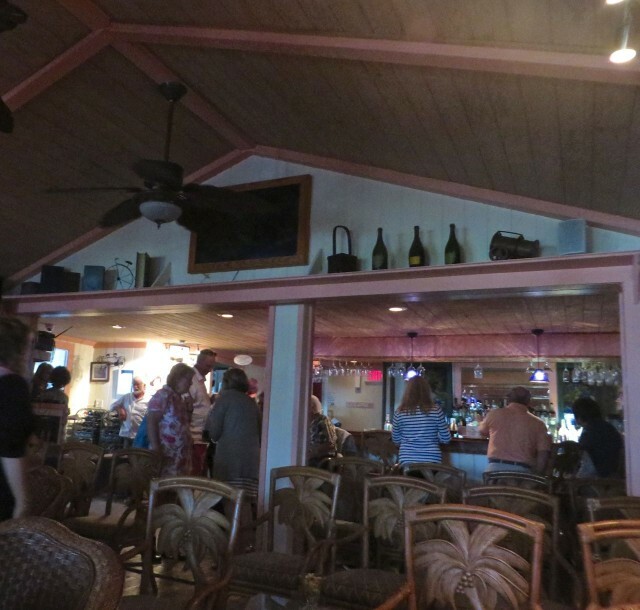 There were another dozen boats and a pulsating beat coming from the beach bar. 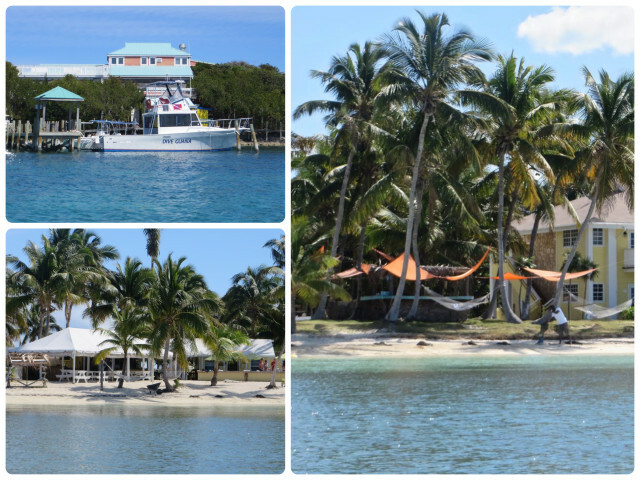 Dive Guana, home of Troy, who frequently gives weather reports for the Cruisers Net in the morning. We beached the dinghies in front of Grabbers, a beach bar. Who can resist hammocks? Every beach should have one or ten. No fear of getting lost with a sign for Nippers like this. This tractor was almost camouflaged with stickers and paint on the other side of the path. 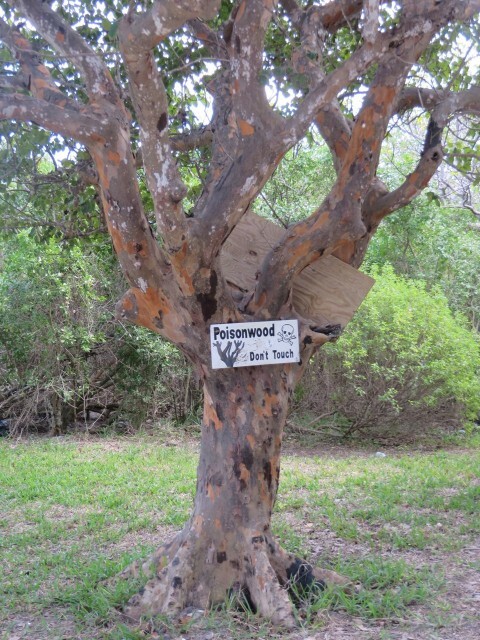 The Poisonwood Tree has beautiful orange bark on the trunk and limbs and is used for carving and furniture, but the clear sap oozes out and turns black. Touching the sap results in a red itching burning blistered rash. Yikes! Stay AWAY from it! The Poisonwood tree’s good side — its nectar feeds butterflies. And then, rising ahead of us, was the multi-colored and multi-leveled Nippers complex. Nippers has a pool for cooling off (no need for that on this day) and an outstanding view of the ocean from the upper decks. 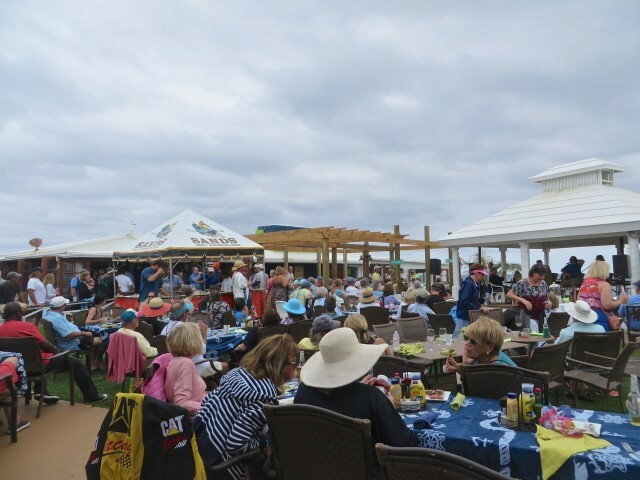 Pig Roast Sunday draws a crowd, but it really wasn’t too bad. 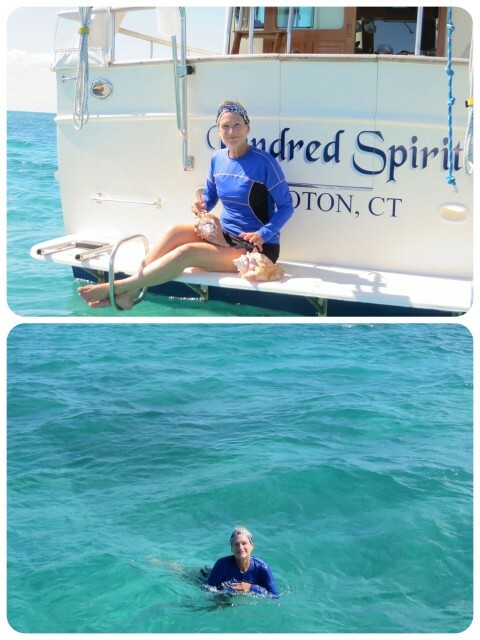 Bottom picture is from Anthony who unknowingly caught us coming down the steps. About the Pig Roast. There was no whole pig turning and roasting on a spit over a fire. Now that would have been special. 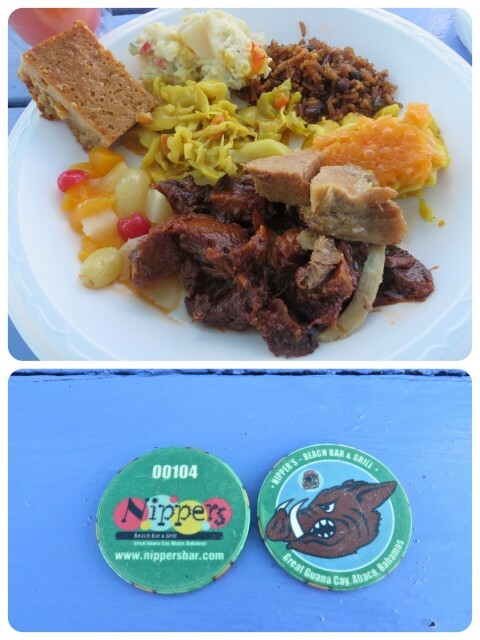 Instead the “pig roast” is a buffet of barbecue pork and chicken with traditional Bahamian sides. Our “Pig Roast ” lunch – pork, chicken, mac ‘n’ cheese, cornbread (not like any corn bread I know), beans & rice, interesting cole slaw, and some fruit salad, aka fruit cocktail. You get these little tokens for the buffet line. 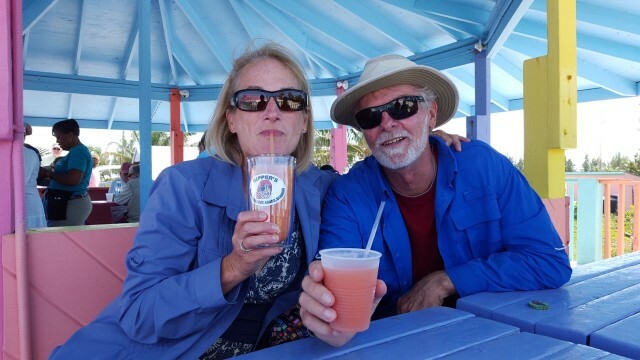 “Nipper Juice” is the bar’s specialty tropical drink, a grown-up slushy made of rum, rum, rum, orange juice, pineapple, and grenadine, and is a lot stronger than it tastes. I did the ultimate tourist thing and bought their Tervis tumbler which becomes a reasonable deal when filled with the juice. I’d rather have the tumbler than wear a shirt with “Nippers” written across it. In spite of the cool weather, people were enjoying the beach, especially these little naked nippers. 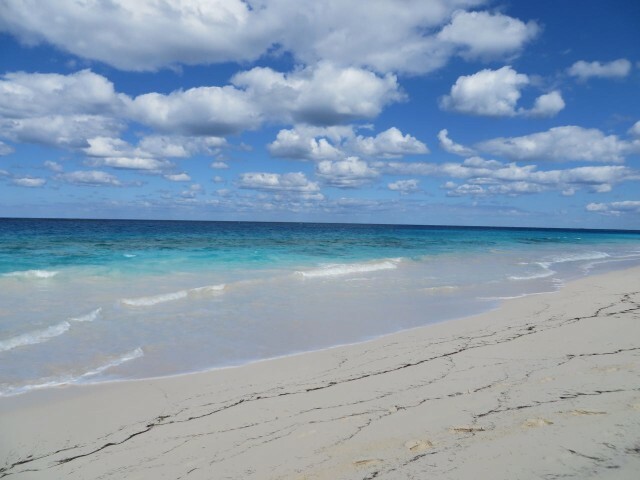 The four of us walked the beach, the true attraction at Nippers; it stretches for a long way, just sand and blue water. The beautiful blue Atlantic Ocean with a blue sky and puffy white clouds. Ahhhhhh….bliss. Nothing like a gold and burning orange sunset to end a fine day. Final thoughts about Nippers? It’s ok. The setting is great but the “Pig Roast” is nothing special. Am I glad we did it? Of course! It’s not all beaches, eating, and drinking down here. 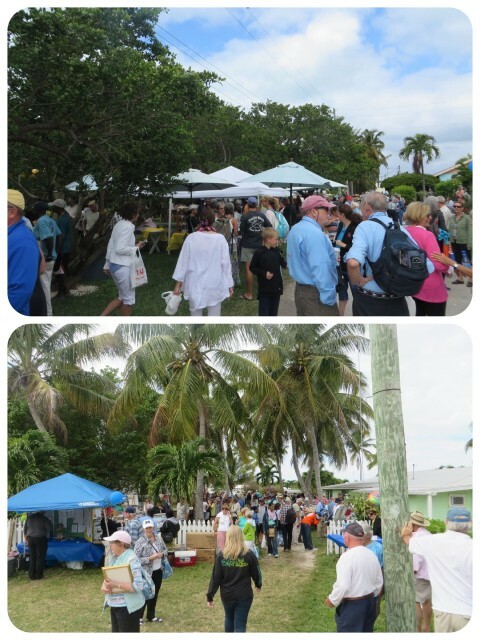 Hope Town attracts and creates lots of interesting things to attend and to do.There’s been some singing and writing going on around here. 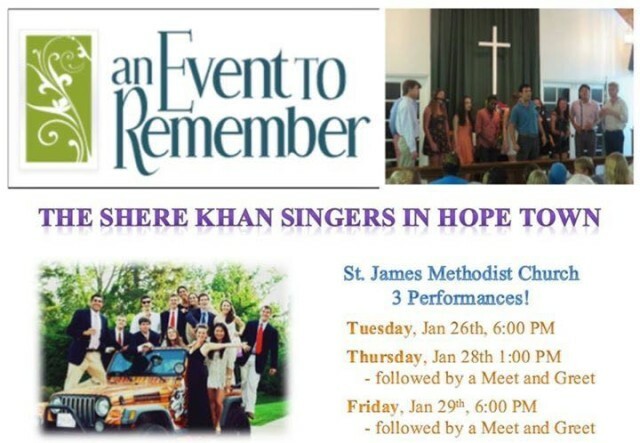 In January, the Princeton co-ed acapella singing group, Shere Khan, comes to Hope Town to perform at the St James Methodist Church every other year, the same Hope Town schedule that we seem to be on. 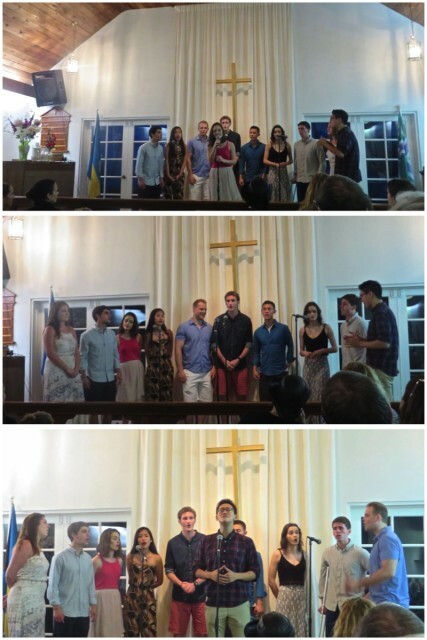 We were excited to hear their benefit concert again, all for the church’s youth group and for a children’s home in Nassau. There were some new members of the group as students graduate over the years and some familiar faces. Shere Khan comes to Hope Town again. The Princeton students warming up behind the church. A very enjoyable evening! I must be getting older because I don’t recognize as many of the songs as I did when our children sang acapella in college, 15 years ago. Our favorite was Simon & Garfunkel’s “You Can Call Me Al.” Gee, I wonder why? 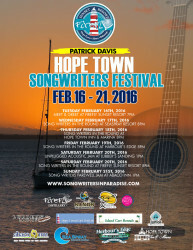 Another event combined singing and writing in the now annual Patrick Davis Hope Town Songwriters Festival. 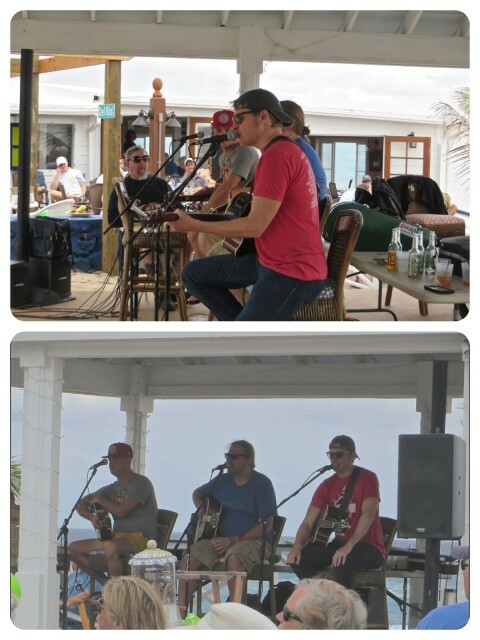 Festival organizer Lorenzo Barigelli of the Firefly Sunset Resort on the western shore of Elbow Cay invited singer-songwriter Patrick Davis to perform at the resort in 2013. 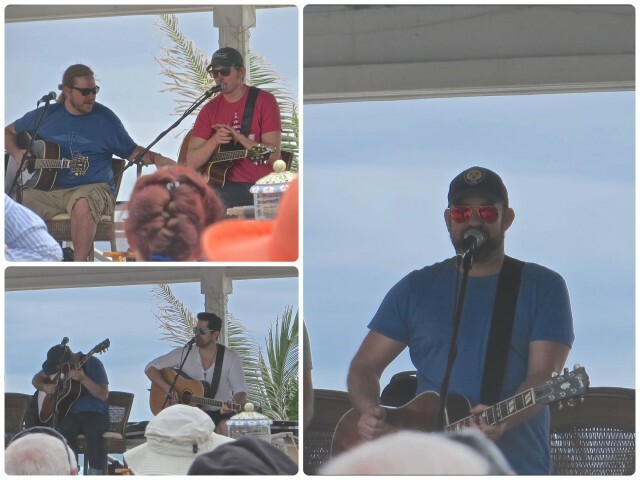 Patrick Davis is a South Carolina bred, Nashville-based country rock singer/songwriter with songs recorded by Jewel, Darius Rucker, Jimmy Buffett, Lady Antebellum & many more. 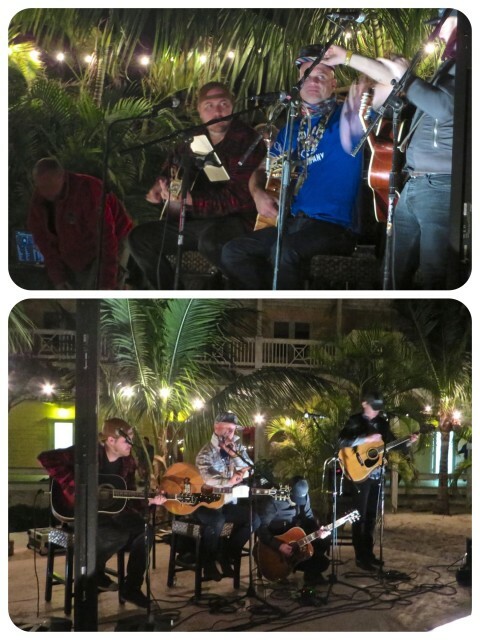 Davis transformed the invitation into a trial songwriters festival which became the 1st Annual Patrick Davis Hope Town Songwriters Festival.” Since 2013, Patrick Davis has overseen the creation of four highly successful Songwriters in Paradise Festivals in beautiful locations such as Cabo, Punta Mita, Mayakoba, and our own Hope Town, Abacos – “in the round, around the world.” These unique venues are more intimate and casual, as well as more engaging, than a typical concert tour. 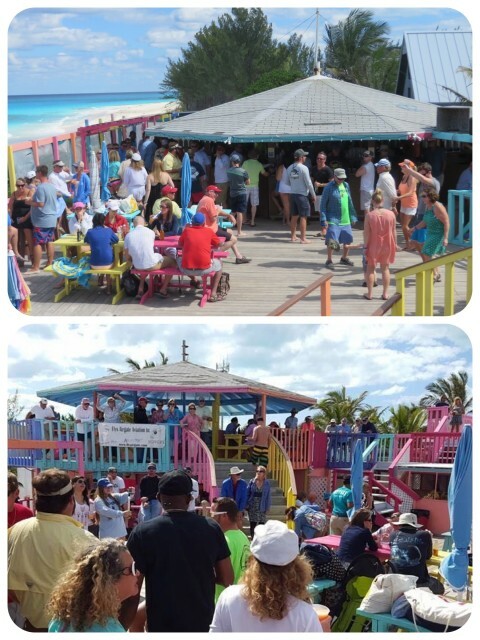 The 4th Annual Festival was held for 6 days here at 6 locations – Firefly Sunset Resort, Abaco Inn, Harbour’s Edge, Sea Spray Resort, Hope Town Inn and Marina, and Lubbers Landing (on Lubbers Quarters). 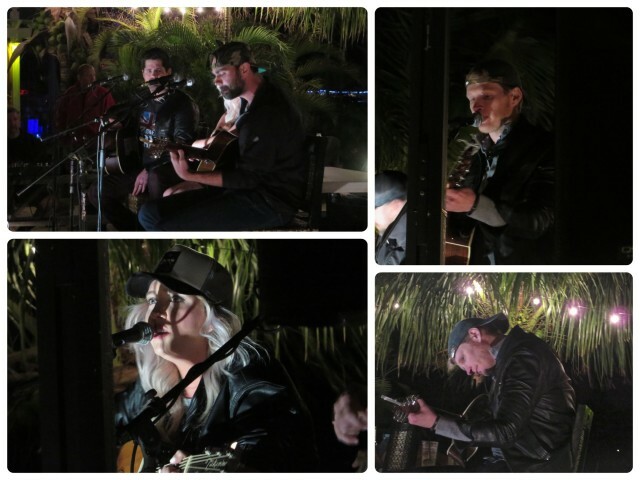 Meet and Greet, In the Round, Unplugged Acoustic Jam, and a Farewell Jam. Many people attend every one of the seven performances, but we just don’t have the stamina for that (How I wish we did, but the evening ones don’t begin until 8 pm……..) We did get to two of the performances. 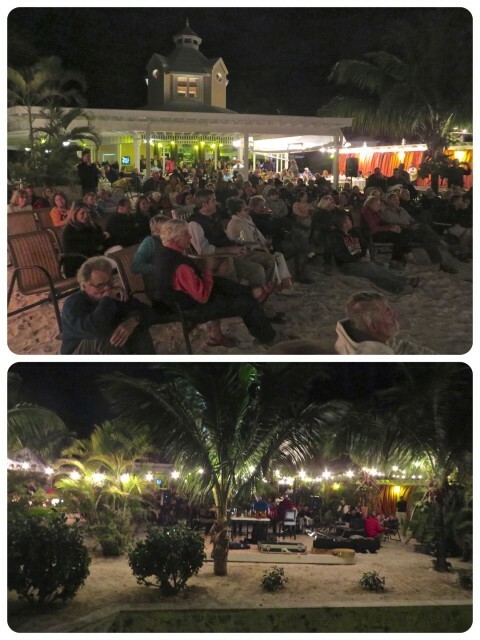 The crowd at Hope Town Inn and Marina spread from the bar to the sand, listening to the singers/writers. 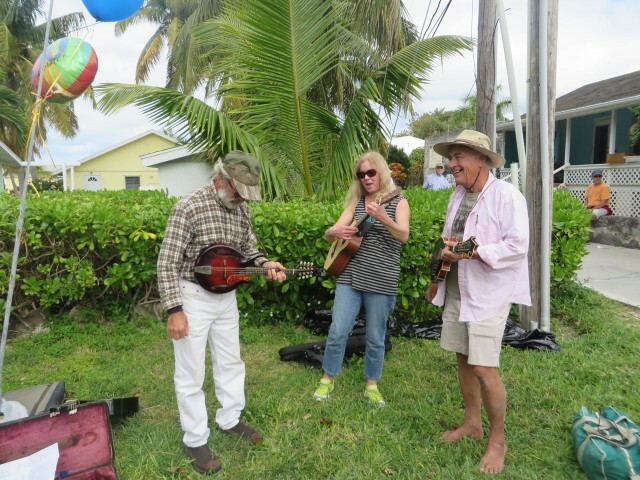 The final performance was in the afternoon at the Abaco Inn. 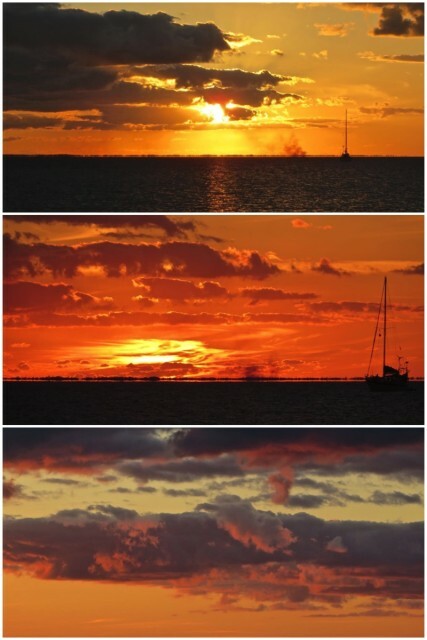 Not only can we stay awake for this, but the photos are a little better – win-win. 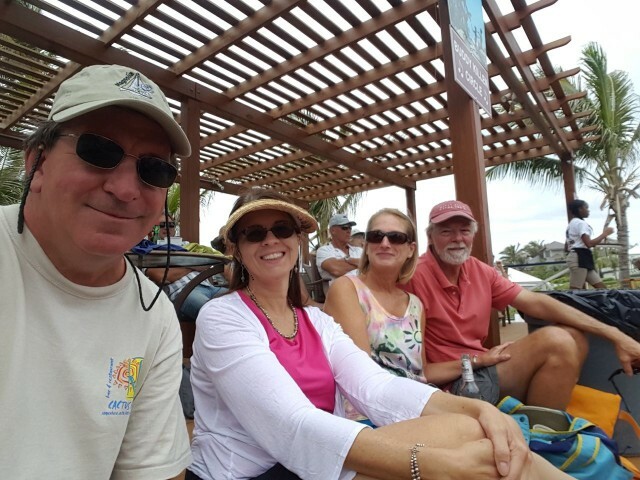 To hear them tell their stories, these singers and songwriters know how to enjoy themselves here on island time. My only disappointment was that they never sang the official Hope Town Theme song written specifically for the festival. I’m glad I have it on my iTunes playlist from two years ago and also on the blog from 2013. It’s a cute upbeat number. Lastly, we go back to “writing” this week for the 14th Annual Hope Town “Writers Read” presentation. 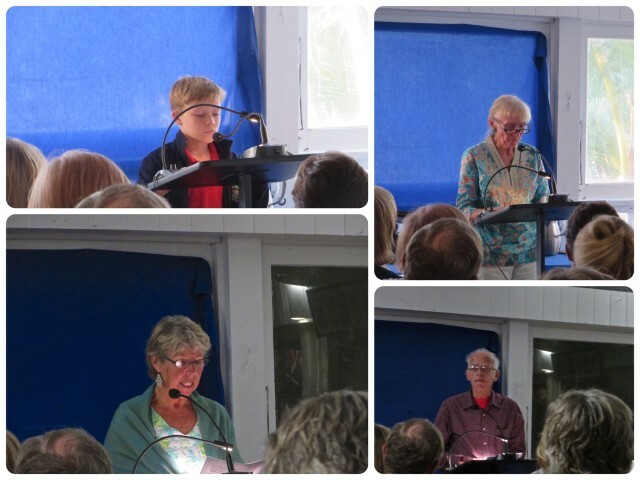 This is an evening when the Hope Town Writers Circle selects members to read their work aloud to an audience. The circle meets on Thursdays and is open to anyone who wants to try their hand at the written word. They share ideas, encouragement, feedback and friendship. The “Writers Read” program is free, but tickets are scarce. Cruising friends gave me their tickets when they learned they could not be here this week. I could not talk either my captain or Magnolia’s into this, so it became a “girls night out.” Annette and Michele from Simple Life joined me, and we had a thoroughly delightful and engaging evening. 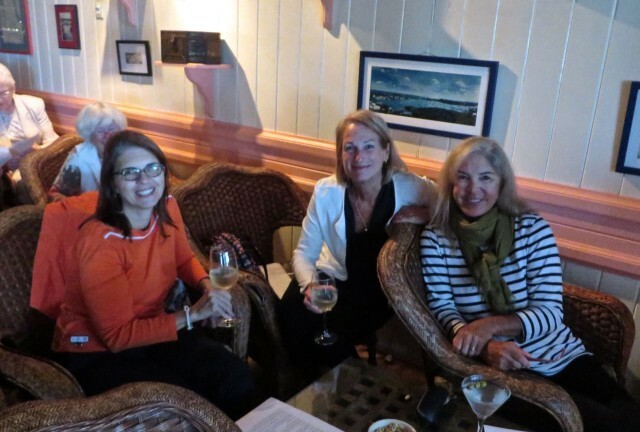 Writers Read was held at the Hope Town Harbour Lodge. 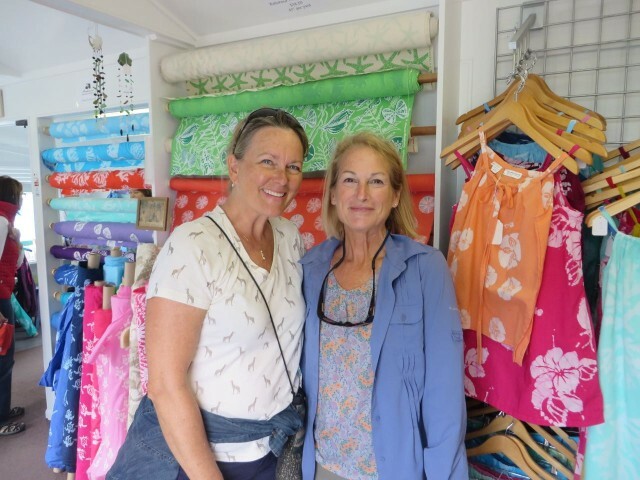 The twenty writers ranged in age from elementary school to octogenarian, born and raised in the Abacos to second-home owner and cruiser, male and female. Their works were poetry, biography, personal experiences, or fiction. Below are photos of four that I knew. Luke is a 5th grader at Hope Town Primary School with a passion for lighthouses; Sharon lives in Oriental, NC (remember our Joaquin hurricane dinner there?) and here on Elbow Cay; Vernon is a native of Elbow Cay and has served as minister and public official here in Hope Town; Di brings her catamaran, Caesar’s Ghost, to Hope Town each winter (in her mid-80’s, she is inspiring). 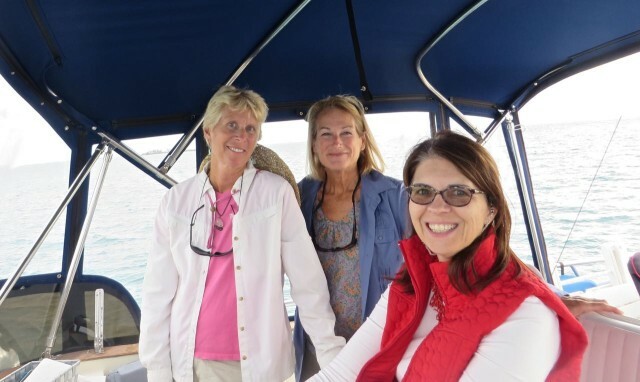 Annette, and two Michele(s), both spelled with only one L.
Another first for me on this evening – I was the chauffeur by dinghy, and it was the first time I ever used it alone in the dark. Check that one off – can do! Kindred Spirit, the Mariner Orient 38 trawler, is a multi-talented boat. She is our home for now and our transportation. She has served as a cargo ship and a temporary storage unit for friends. Yesterday, Kindred Spirit tried out a new role as a ferry boat. Ferries from the other islands were all taking reservations for the trip to the Man O’ War Flea Market. 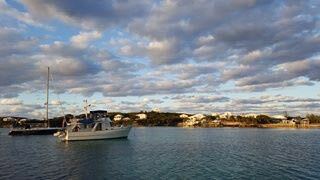 We decided to gather a few friends and use Kindred Spirit as our own personal ferry for the 5 mile trip from Hope Town. Dan and Marcia (Cutting Class) and Anthony and Annette (Magnolia) joined us for the day trip. Magnolia’s dinghy was left tied to our mooring, a sure sign that THIS mooring was not available for pick up. Cutting Class’s dinghy and ours were tied off of the transom. A look back as we were leaving the harbor and — uh oh!!!! A dinghy is loose!!! 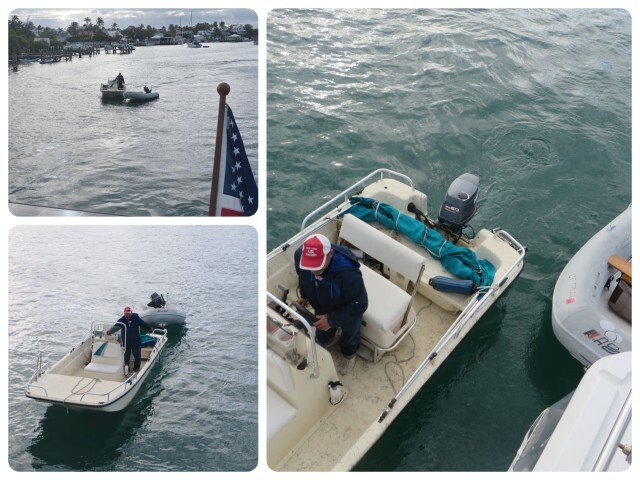 A kind gentleman on a skiff quickly grabbed the line and brought the wayward dinghy back. As he handed off the line, he commented, “If you can’t tie a knot, tie a lot.” 😉 It happens to us all at one time or another. Man time on the aft deck. 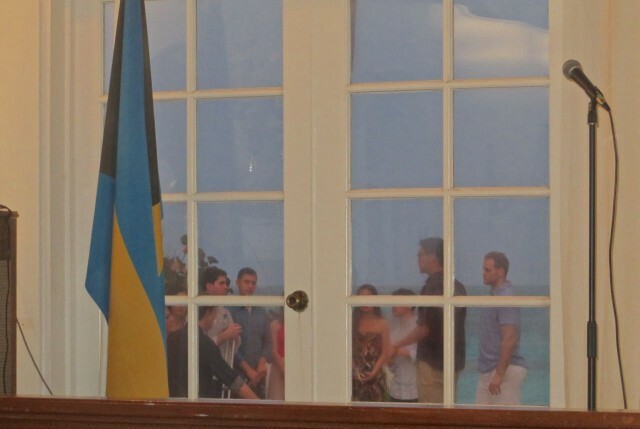 Maybe they were keeping a closer eye on those sneaky little dinghies?? Ladies on the bridge, steering and navigating. Al handed the wheel over to Annette who did a very fine job as captain. Her first time handling a trawler. Whoa! 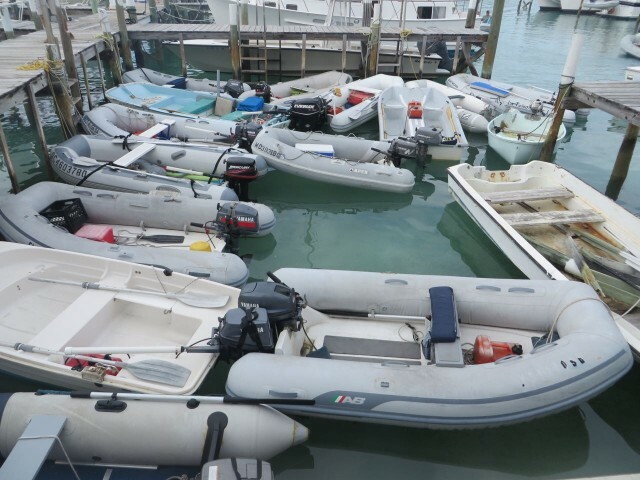 The dinghy dock is more crowded than we have ever seen!! We were surprised and delighted to see so many people wandering about. 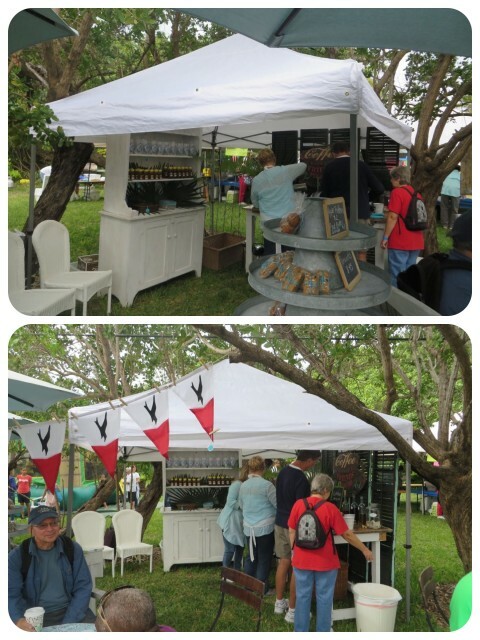 In addition to the flea market tables, there were food tents and games for the children. A little group of musicians entertained folks as they shopped and ate. 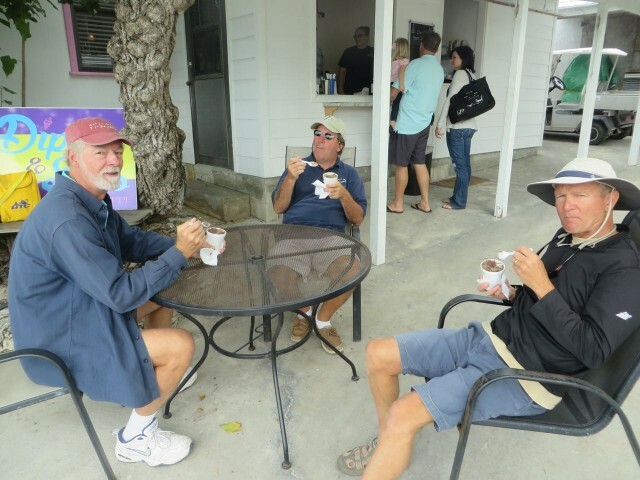 While the girls hunted for bargains, the “boys” had their ice cream fix – Pirate’s Plunder, that chocolatey Bahamian favorite. 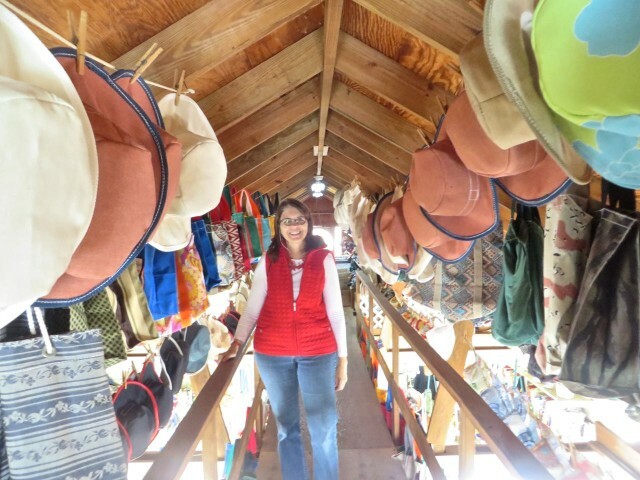 Annette in the loft of the “Sail Loft.” We both enjoy visiting this shop and chatting with the ladies who sit and sew at their very ancient and durable sewing machines. Funny story about this next photo. I ran into another cruiser, Sandy on Horizon, that I had met two years ago in Ferdandina Beach, FL, who excitedly said I must meet her friend, “the other Kindred Spirit.” We had heard the call sign “Kindred Spirits” on the VHF since we arrived in Hope Town and did see this other Kindred Spirit once over in Marsh Harbour – a large and stately Nordhaven motorsailer. Sandy introduced me to Karen who exclaimed she needed a selfie of us together! 😉 As we talked, I was most amazed to hear how they came to name their Kindred Spirits. From Anne of Green Gables – just like us. Imagine that. 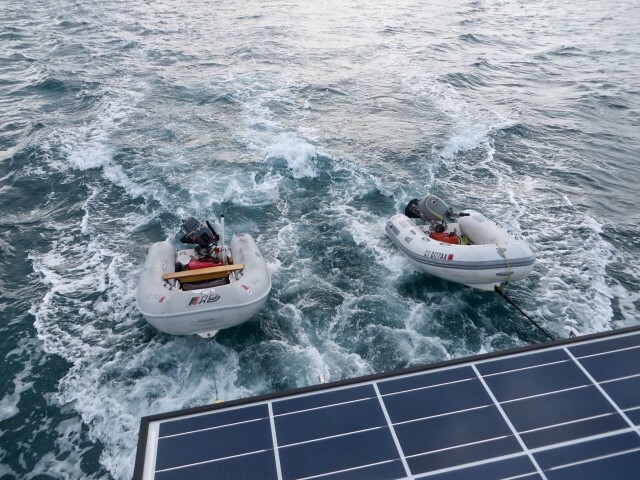 At least we can distinguish each other by the plural and the singular, although that is often hard to determine on the VHF. Karen from “the other Kindred Spirit,” — Kindred Spirits. 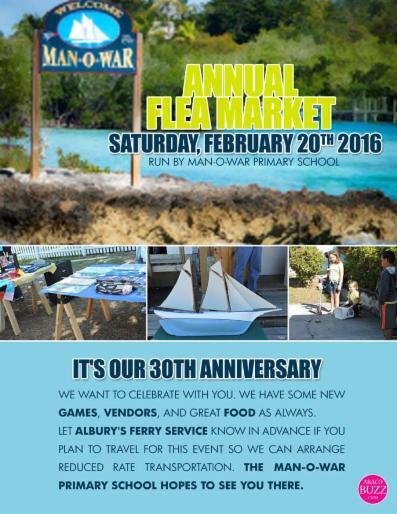 The six of us enjoying our day at the Man O’ War Flea Market. By noon we were ready to return to Hope Town. 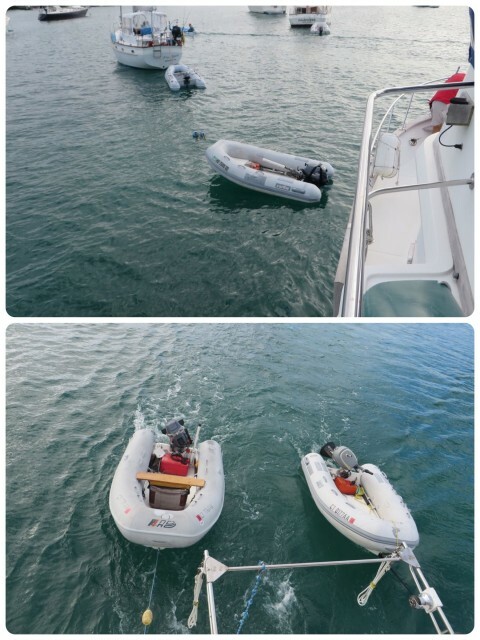 The dinghies behaved very well on the return trip. I took the helm from beginning to end for this leg. So, I am thinking, ladies, when shall we do an all-girls trip and leave the guys behind???? After naps and chores, we gathered on Magnolia for dinner. Anthony made his delish chili. 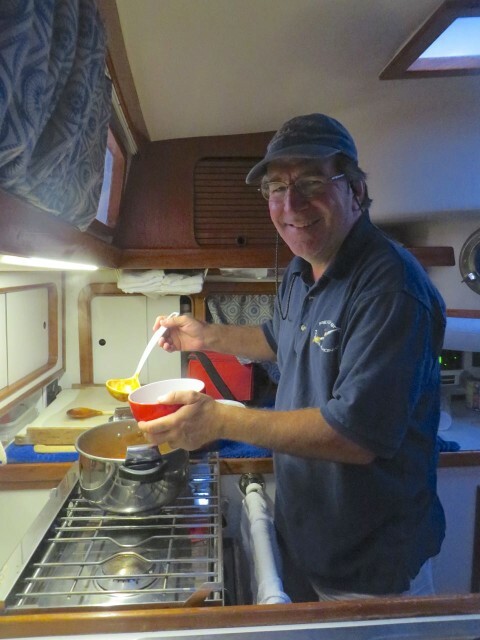 The chef at work in his galley, serving up the A2B chili special. 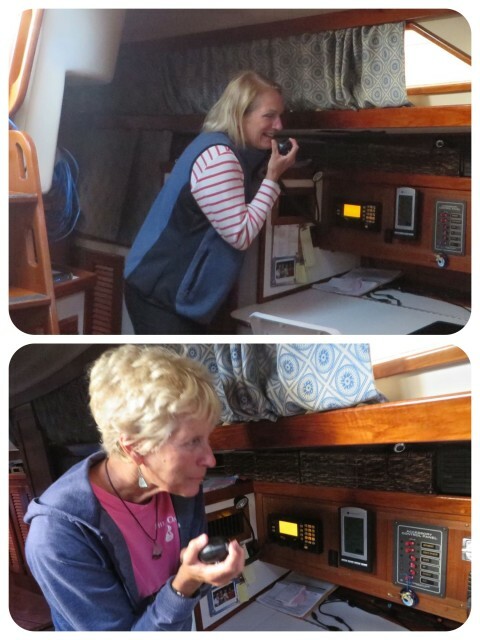 Magnolia has a Single Sideband marine radio and made arrangements with Sue and Dave on san cles (our other Shenny cruising buddies) to talk. They are the truly salty ones and are now in the Dominican Republic. How cool was it to chat with them on the SSB??? Very cool. We are all so happy for them, off having the adventure of a lifetime! Dinner on Magnolia. We feel at home on this sister ship, a Morgan 44 CC. Another day, another “first.” Good times with good friends on the water.